Addition and subtraction are inverses, you can use one to undo the other. If the equation involves addition, you will need to use subtraction to get the variable by itself. Let's say we have the solve the equation below. When you solve an equation, the goal is to get the variable by itself on one side of the equation. In the equation above, 2 has been added to x. How do you undo addition? You use subtraction as the inverse operation. Step 1: Use the inverse operation to get the variable by itself. ​Plug in 5 for x in the original equation. Does 5 plus 2 equal 7? Yes. This means you have the right answer. 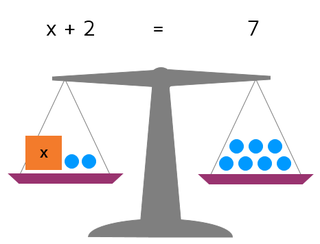 When you're solving an equation, you can think of it as a balance scale. 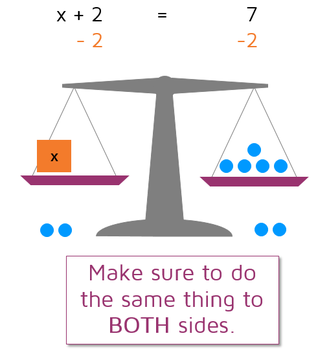 Think of the equals sign as the balance point in the middle of the scale. The "weight" of the left and right sides of the equals sign have to be the same. ​If you do anything to an equation, it's important to do it to both sides so that it stays balanced. We can't change the "weight" of one side without changing the other side by the same amount.